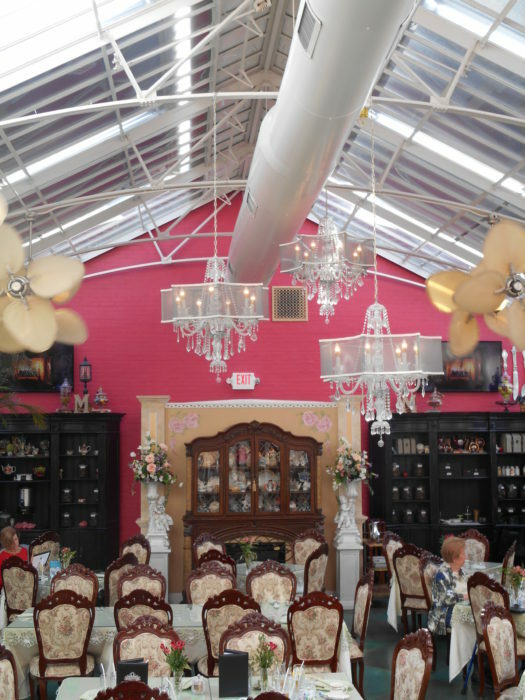 Located in the Central West End of St. Louis is the posh and slightly kitschy MaryAnn’s Tea Room. From the street you walk in through a little boutique which is the perfect place for the fashionista in you to stop and shop! To get to the tea room, walk in and through the shop all the way to the back. 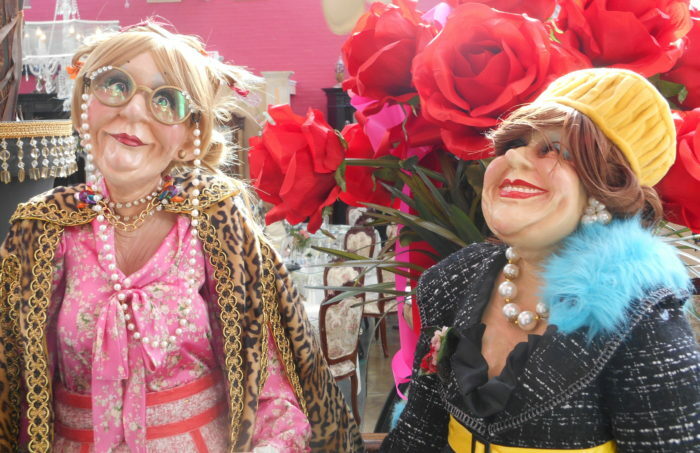 You’ll know you’re in the right place when you see these two ladies at the entrance to the restaurant. They’re not fashionistas (more like just this side of tacky) but they definitely are a hoot! This place is magical due to several wow factors. The restaurant was a greenhouse in its former life and keeping the glass roof is a stroke of genius. 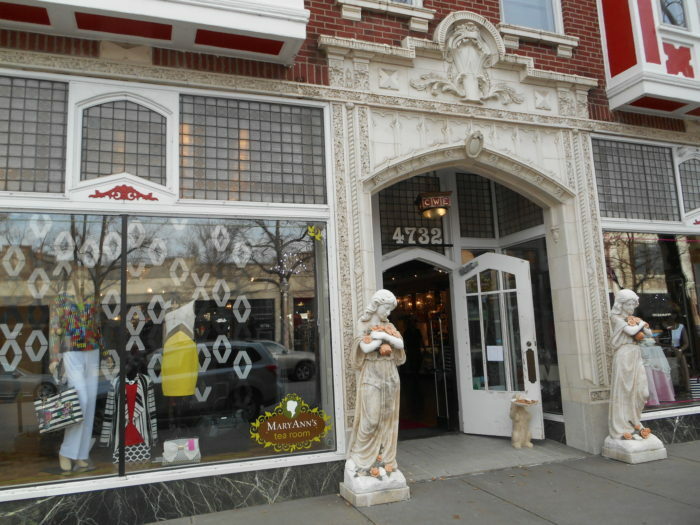 We were told that they also still have heated floors that helped warm the plants in the cold St. Louis winters and now keeps their customers warm too. Here is a the view of the restaurant as you first walk in. 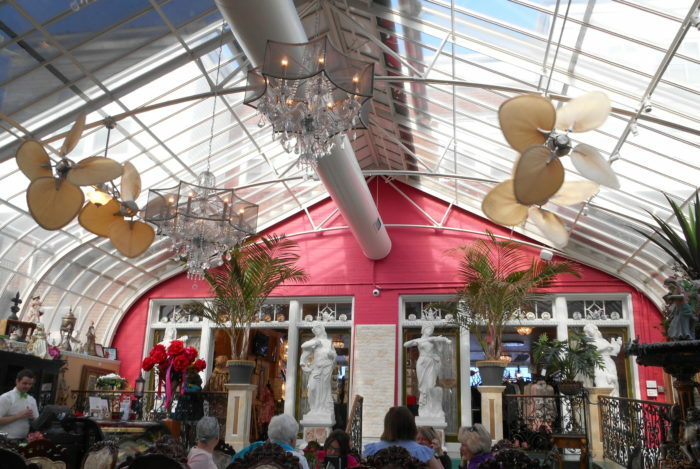 Even though the restaurant just opened in 2014, the chandelier, tropical fans, and palm trees make you feel like you’ve gone back to the roaring ’20s and are visiting with the Vanderbilts in their conservatory. The whole placed is bathed in sunlight. I just kept looking up – as one always should! This is the view looking to the front. I’m often distracted by shiny things. The sparkly, jewel-encrusted napkin rings and the sky reflecting back on the glass topped table got my attention. Just lovely. The little touches like the embroidered cloth napkins and lace tablecloths let you know you’re in a special place. Now to the important stuff… How was their tea? They serve black, green, herbal, and seasonal teas. I chose the Black Currant. 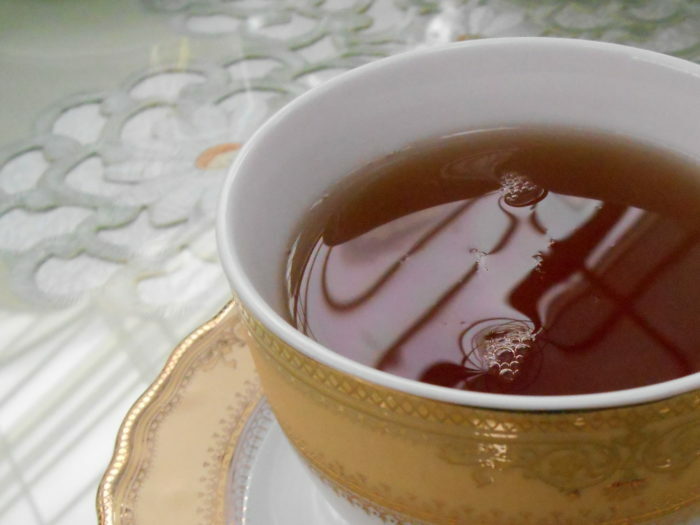 The rich brown tea was smooth and velvety with a very light fruity touch. I splurged and got the quiche of the day and soup combo. The golden brown, single-serving size quiche was a bit more sophisticated than you might normally find. The shrimp, broccoli, and cheese was a welcome combination in the creamy custard. 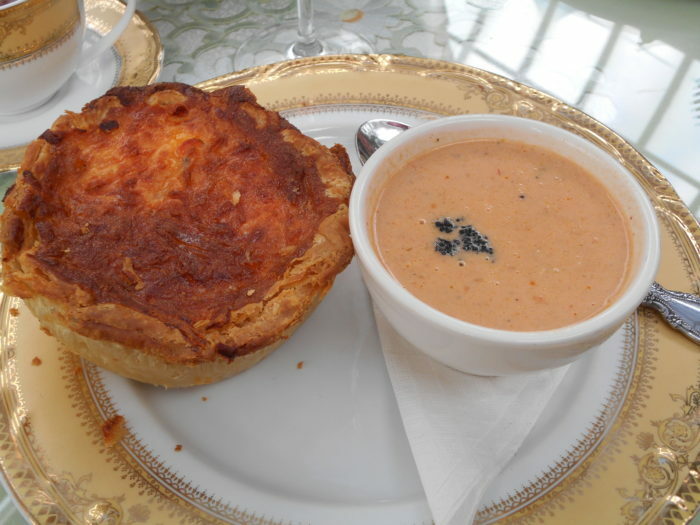 A nice cup of creamy crab bisque was served alongside topped with a dollop of caviar. I enjoyed every bite! Here is their soup and salad combo. 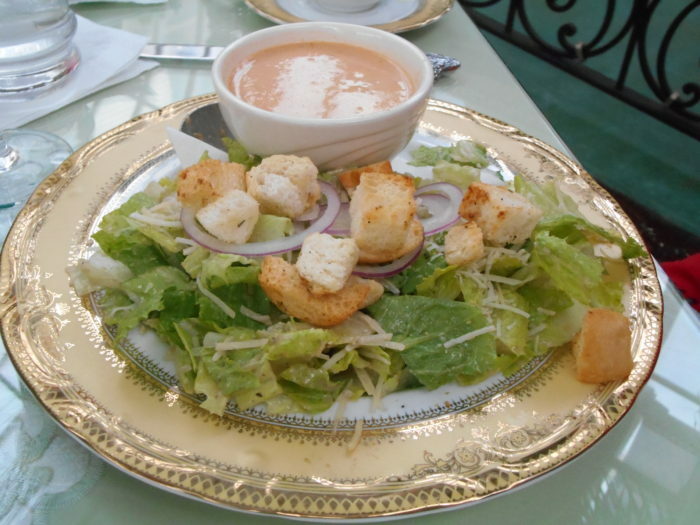 Specifically, crab bisque and the Classic Mayfair Salad. I was told that it hit the spot! 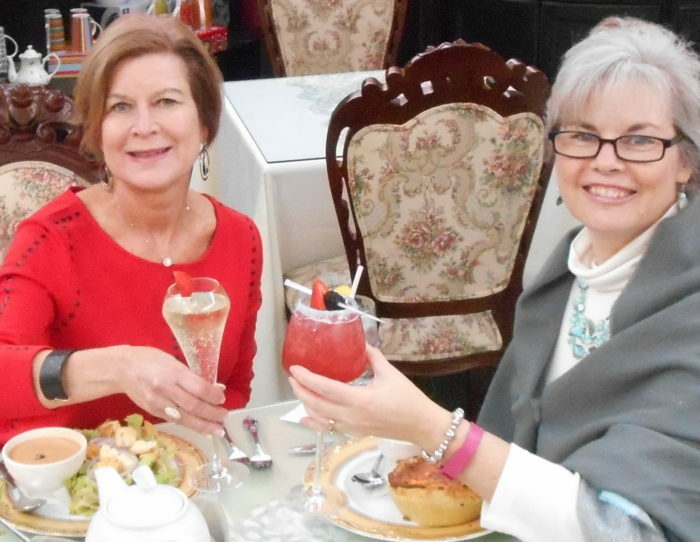 My friend, Beth, and I toasted the afternoon with champagne and a Halper’s harvest tea infused cocktail. It was a combination of blueberry merlot and raspberry nectar teas with pear juice and vodka. It was quite tasty! 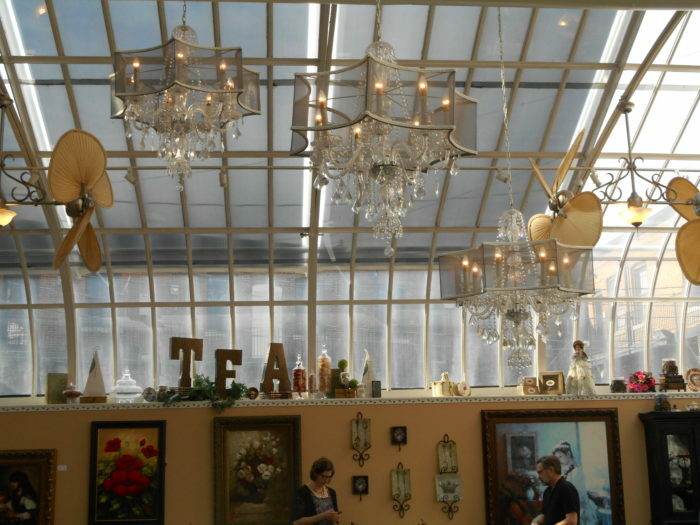 I highly recommend visiting MaryAnn’s Tea Room in St. Louis! It’s quite a treat. Cheers y’all!